The top is done. I'll take it Thursday to St. Annes so the ladies can sandwich it. Then I'll take home to quilt. We want to give it to him in December for his birthday. Measures 45 by 63. I kinda like it. Came out pretty good for a D9P. What have you been up to? Leave me a comment and I'll come by and see your eye candy. Linking with Connie for Linky Tuesday and Esther for her WOW. See you there. It looks great and it is so masculine. I'm sure he is going to love it! I'm a beginner applique quilter. Like it. Congrats on the finish. I think it turned out terrific and love all the notes. Oh yes! Love this one! Great fabric choice. Your appliques are just perfect. Great job! Beautiful! I'm sure it will be well received. But what is a D9P pray tell? What a lovely fun quilt! It is very nice. 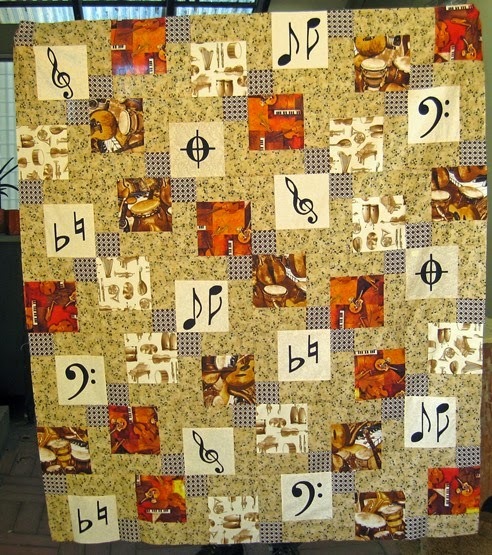 I have a collection of music fabric. This looks like a good idea. Thanks!